Spice and Sass: The Back of Your Head Looks Like A Face! Just realized I haven't told y'all about the massive amount of fun that was Kinger's wedding in Athens two weeks ago. I was too busy talking/laughing/dancing/drinking to take any pictures, so once some come in I'll be sure to share how completely gorgeous it was. I'm also obsessed with the table toppers, and kicking myself for not taking a picture of them since I want to fashion my own now. Anyway, before the real pictures come in, I have to tell y'all about Pascal. Parisian Coffieur to the stars and Kinger. 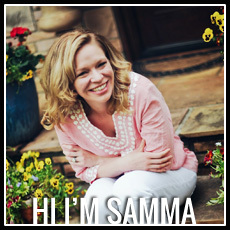 Hater of all things Samma. Seriously, the man detested me. I was in trouble for the following (1) not having my coffee (2) not bringing him coffee (3) having too thick of hair (4) straining his shoulder due to my unreasonably thick hair (5) moving my head too much (5) having too many layers and most of all, (5) having the audacity to tell him I like my hair down or half up, especially since I have bangs. These issues led to this. Well, it was quite windy, which is why the coffieur insisted on my hair being up, and was outraged when Preston and I went outside to check out the wedding preparation. I made the situation far worse when my lawyer side kicked in, and I suggested that my hair should be able to withstand wind since pictures and the ceremony would both take place outside in said wind. Then I ended up with a rat tail. So ladies, lesson learned. Never tell a Frenchman what to do, or you shall end up looking Gwen Stefani in the mid 90's. And hey it could be worse! I'm cracking up right now thinking about it. And, the bride looked beautiful, which is all that matters! No one noticed the self-cut booger hair of her minions! Hee. So Kinger, Congratulations and welcome back from your tropical honeymoon this week! Send me pics as soon as they come in! That is just too funny! Watch out for testy Frenchmen wielding hairspray - they hold all the power! For what it's worth, your hair looked beautiful from the front. From the back, I do have to concur with your Gwen Stefani circa 1990's assessment. :) Gorgeous dresses too! lolololol- what a nutjob! like seriously, you could have just hairsprayed those two little mini buns back and pinned the excess hair that was falling out of the main bun. i am dying laughing. thank God someone finally told you the truth about your hair. Really, do you cut it yourself? The frenchie sounds crazy/hilarious! Glad y'all were able to have fun and laugh about it. Looks like you had a ball at the wedding! HA! Oh, I've got to send you a picture of me in Slovenia getting my hair done for my SIL's wedding. Why in the world I thought it would be advisable to leave my look in the hands of chain-smoking Eastern Europeans is BEYOND me! I was already bloated all to hell at that wedding anyway --- my "Carmen" hair and corresponding soap opera makeup made it so much worse. But from the front, your hair looks gorgeous! So there is that. Ah well, I suppose your hair just made the bride shine more! I'm crying laughing because I've been there. I think that brides secretly tell their hairdressers and make up artists to make their bridesmaids look ghastly (not that you in any way looked ghastly). I swear every time I've been a brides maid I felt like I was being hazed. this is too funny!! I am in a wedding this weekend and I hope our stylist is nicer than that guy! Hahaha I second the comment about being 'hazed.' The last wedding I was in, the hairdresser pulled all of my curly hair in a knot on the TOP OF MY HEAD. Oh Lord it was awful! Bahahahaha! Too funny! The front looks great though! 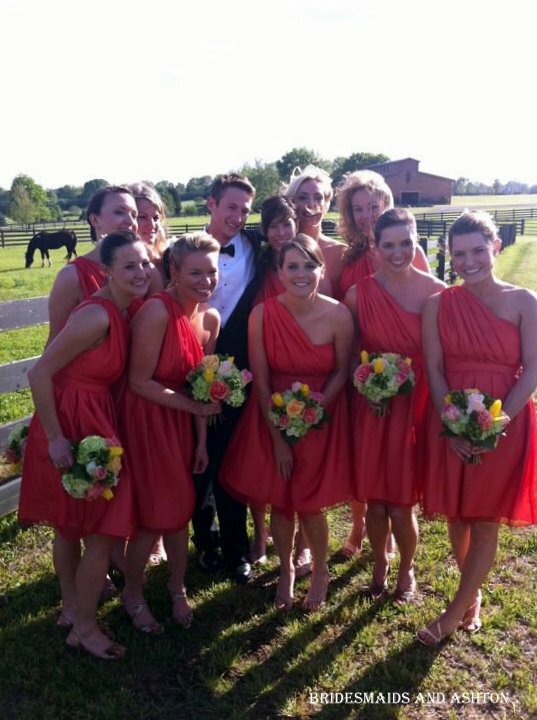 And I love those dresses (great color!). Oh my gosh, I cannot stop laughing after reading this post! Those dresses are gorgeous and I'm sure everything looked amazing. But that is just too funny! I am so sorry that happened to you. You looked gorgeous anyway! After this incident, he packed up and moved down south to "start fresh." For the record, your hair is fabulous. And your friend's hair is wonderful as well. I cannot believe someone would say such mean things! I had spent for thіs info! Thanks!